Have you ever heard or said the following about new people in your organisation? While skills and knowledge are necessary for successful job performance they are not sufficient. Successful people also need the right personal attributes to succeed and they need to fit with the organisation. Yet most people fire people or consider them unsuitable because of their personal attributes. We have situations where the employee can do the job, but they just don’t fit in - with the boss, with other employees or with the organisational culture. 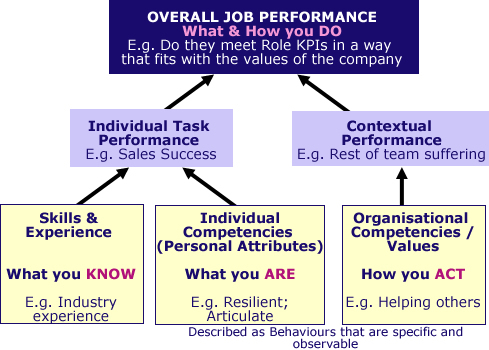 In this model of on-the-job performance you can have someone who may be individually performing, but if their contextual performance is poor, they still may not be seen to be performing well in all areas. In addition, a competency framework can be a key element in any change management process by setting up new organisational requirements and desired behaviours. Best practice Recruitment and Selection processes – Selecting the best people who fit with the role competencies and organisational culture. Interviewing, referee checking and psychometric tests should all link to the competencies for the role. This ensures both fairness and legal defensibility of the recruitment process. Niche Consulting has worked with clients to develop their own competency framework and for clients who prefer to use a generic framework, we have our own rigorous and ready to use model. We assist clients to define the competencies for a role by doing a competency profiling exercise which is comprised of a “competency card sort”, using the Niche competencies and key client personnel. Our framework has over 70 competencies in it under the following 9 sub groups. Each competency is defined overall and also has behavioural definitions for up to 4 different complexity levels.